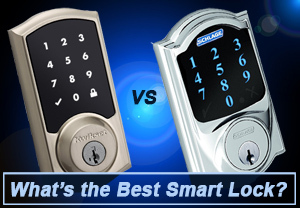 Schlage vs Kwikset Electronic Smart locks - which is the best for you? 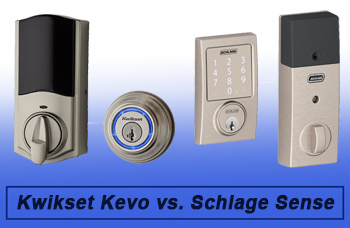 Schlage Vs. Kwikset – What’s the Best Smart Lock? Indeed, Schlage and Kwikset have succeeded in building a reputation in the locks industry. Having dominated the deadbolts market, they are now deep into Smart lock innovation with several masterpieces already in the market. You will notice that even though brands like August, Yale, and Danalock have tried to stay afloat, it is these two brands that trend in Smart lock conversations. However, there seems to be no clear winner between the two, and that’s what we want to look into today. Both brands offer several models each with a unique design and features. We will look at the popular models of each brand before comparing them to see who the winner is. So, without further ado, let’s get down to business. Established in 1920, Schlage is a top brand that has dominated the scene with their high quality and secure locks and deadbolts. Now they have ventured into Smart security with top of the range Grade 1 ANSI/BHMA Smart locks. Schlage is an excellent choice when it comes to Smart locks bearing in mind they have a long tradition of excellence in deadbolts. This is a small keypad Smart lock that is suited for those who want an accent lever. However, you will have to sacrifice the much-envied touchscreen display as it comes with a physical rubber keypad, but very durable and fingerprint proof. If you are looking for a simple residential Smart lock that is super easy to install, this should be a priority bearing in mind it comes with a lock and lever. Actually, this is a way you can save some bucks when building your house. One thing I like about this lock is the Z-Wave protocol which is great for anyone who wants unlimited connectivity. Unlike Sense, you can connect the Schlage Connected Keypad to your Smart Hub. So, if you have an existing Smart Hub or you have plans of getting one, this is still a hit regardless of its simplicity. The only thing I felt that this lock really missed in an inbuilt alarm. At least it should have a way of physically notifying you when you are within the house. Also, it has a notably short 1-year warranty when the rest have 3-year warranties. 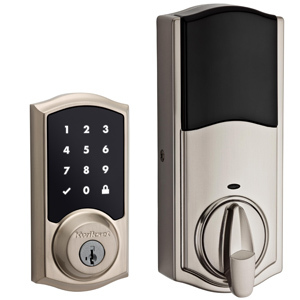 The Schlage Connected Keypad is a great choice for residential homeowners and a cheaper option if you are on a budget. This is considering the fact that it comes with a Smart lock and an accent lever. It is also Smart Home ready even though it lacks the ‘fancy’ touchscreen display and its lock is Grade 2. Sense is a standard Smart lock that has been built for heavy-duty doors, both commercial and residential including safes. It features a clean design and anyone with basic screwing skills will be able to install it in minutes. With a Grade 1 deadbolt, you won’t have to worry about lock bumping and breakings. Sense comes with 30 access codes, it is ideal for small and medium-sized offices, and even safes. The most important thing to note about this lock is that it uses Bluetooth. You don’t need a hub or voice control to operate; only your Smartphone and you’re good to go. It also works with Apple HomeKit so if you feel discriminated on as an iPhone user, this is where you will find solace. Another interesting thing about it is that even though it doesn’t have Z-Wave or Zigbee protocol, there’s something called Schlage Wi-Fi adapter. I won’t say it is such a unique or a must-have feature because I find it as a cover by the fact that Sense lacks remote operation and the adapter makes this possible. It pairs up to 2 Schlage Sense Smart locks and connects them to the Smartphone App but so far it doesn’t work with HomeKit. This lock is available in 3 trims; Camelot, Century, and Satin Nickel and a range of universal finishes. The only problem with this model is that it limits Android users. If you are looking for a secure Smart lock that will work with your Apple devices, this is your match. 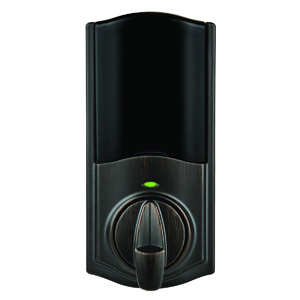 It features a solid Grade 1 deadbolt and an alarm system that will help you monitor your home and act fast in the event of a break in. However, if you use Android, you should consider Schlage Connected as this one only works with HomeKit. This is an excellent lock that is ready just like its sibling, the Connect Keypad. However this one has a touchscreen display, is bigger and doesn’t have an accent lever. It is bigger in size, performance, and security. It features a touchscreen display and a Grade 1 lock system which makes it out rightly better than the Connected Keypad. A would-be competitor of this lock is Sense considering they share a lot in common. They have the same design, touchscreen panel, 30 codes, Grade 1 locks, and even trims. However, there is some difference in the compatible voice controls and also the connectivity and remote control. Please note that the Schlage Connect uses Z-Wave and ZigBee protocols so you can connect it to your existing Smart Home automation. I have included mine in my Wink 2 and so far so good, I have nothing to complain about. This is contrary to some previous reports that suggested it supports only Nexia Bridge which is not a favorite to many because of the monthly subscriptions. I have also tested it on SmartThings togethr with the Connected Keypad model and I can confirm that it is compatible with other hubs apart from Nexia Bridge. Regarding voice-control, this lock is compatible with Amazon Alexa and in the dawn of 2017, it was announced that it is now compatible with Google Assistant. This lock is available in 3 trims; Camelot, Century, and Satin Nickel. On the downside, it doesn’t work with Apple HomeKit. This limits a lot of users considering a large chunk of America’s Smartphone users have iPhones. This is a solid lock that you can comfortably spend your money one if you want reliability and you are keen on having a Smart Home. But if you are an Apple HomeKit fan, sorry, this isn’t your product! Venetian bronze, Polished brass, Satin Nickel. Kwikset is another top brand that has scaled the heights just like Schlage. Having opened doors in the 40s, Kwikset has also left a legacy of reliability in the locks market. 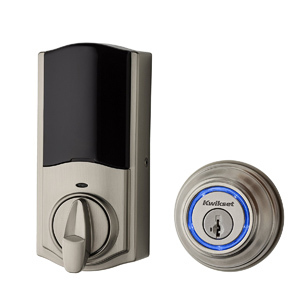 Even though I am a fan of Schlage, I still have a liking for Kwikset Smart locks because you can just use them with your Smartphone; no need for Smart Hubs or voice assistants. However, if you are looking for something to work with your home automation, I recommend Schlage Connected or Connected Keypad. For now, let’s look at some of Kwikset’s popular models. This is a strong and very solid Smart lock that has been built with an all-metal body for maximum security and durability. 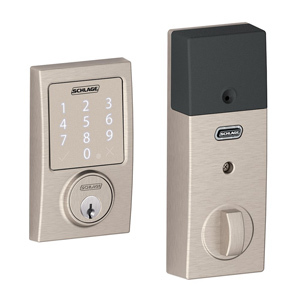 Were it not for the fact that is has a Grade 2 lock, I would compare it to the Schlage Connect because of the overall body design and most notably, the touchscreen display. Even though you might despise it for its having a Grade 2 lock, it has a wide array of Smart security features including; SecureScreen technology, SmartKey, Smartlock, and so on. Besides being Bluetooth Enabled, it works with Apple HomeKit so unlike Schlage Sense, you can tell Siri to close or open the door and she will oblige. Even though you might disregard it for not having fancy features like Schlage’s anti-smudge touchscreen, I learned there’s a way it makes your access code less vulnerable. It first asks you to key in some random code before inputting your access code. This reduces the possibility of thieves trying to guess your code by tracing smudges. For this, I would say Kwikset is quite prepared considering the recent wave of access code manipulation and hacking. There are three ways through which you can open the lock; App, Siri, or the code (maximum 30 entries). What I like most about this Smart device is that it gives you total control of your home. You can always check whether the door is locked or not from the office, or even lock it when you forgot to before going for your morning run. This lock is available in 3 color options ; Venetian bronze, polished brass, and Satin Nickel. On the downside, this Smart lock is compatible with iOS only so if you are an Android user, this is not your match! Kwikset Premis is a great Smart lock that has been designed to offer airtight security. Even though it’s only for iOS users, at least it is HomeKit enabled – nothing is convenient like telling Siri to open the door when you are back from work tired! The story of Kevo can be told in 3 words; smart, compact and secure. As the name suggests, it’s opened with a touch. Another thing, from outside, it just looks like a normal lock; same size and design. What makes it noteworthy is the Touch operation. It connects to your Bluetooth and uses proximity sensors to know your location. Once you near the door with your Smartphone, opening, and closing is simple, with just a tap and you are good to go. When it comes to usage, it can serve both residential and commercial purposes courtesy of the25 eKey entries. Even though the original model caught everyone by surprise, it failed to impress because of the bugs and frequent unresponsiveness, especially with the touch. Kwikset really did their homework – you will hardly find it hanging like the previous model. Perhaps the best thing about Kevo is the bumper proof design. With the rising cases of lock bumping, you will finally have the peace of 100% security. A key fob is also available to give you more ways to access your lock. Even though it looks vestigial, it comes in handy when you are hosting guests. Another thing I liked about Kevo is that at least, it has Kevo Plus for remote operation. You can always monitor your home remotely. This makes it a great and affordable choice over Sense because with Sense you will need a Wi-Fi adapter sold separately for remote Smartphone App control. Unfortunately, this lock lacks an inbuilt alarm just like Schalge Connected Keypad. This means you will only depend on alerts in case of anything. Kwikset Kevo Touch-to-Open is a great choice when looking for a more functional Smart lock; the Touch-to-Open is one of a kind technology. On the other hand, the normal design deadbolt makes it a very discreet security feature, perfect for securing doors without raising eyebrows. 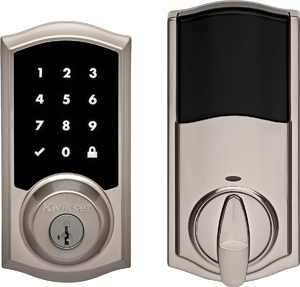 SmartCode 916 is another superior Smart lock from Kwikset that is best for homeowners who want to automate their door locks. This is because it works with Z-Wave protocol thus it can work with a Smart Home hum like Wink and SmartThings. The good thing about this lock is the easy installation that is, in fact, a DIY project if you have a screwdriver. I tend to compare it much with Schlage Connected because they are all compatible with Z-Wave, and notably, they have touchscreens. However, Schlage takes the crown because it is also compatible with ZigBee, a protocol SmartCode largely misses out on. Just like Premis, it has SecureScreen, a feature that requires you to first enter some random code before your code to protect it from guess-hacking. At least, together with the Grade 2 deadbolt, it guarantees maximum security on your door. The fact that it works with Alexa is also exciting. If you have Echo, you just need to pair it up and tell Alexa to shut the door instead of walking up to it the old-fashion. 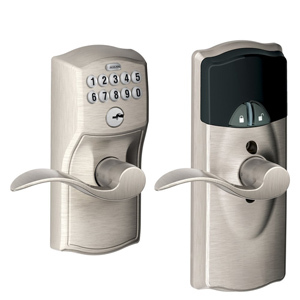 This lock also has the industry-leading Touch-to-Open technology just like Kevo. So, here, SmartCode takes some points considering Connect doesn’t have such a feature. It comes in 3 distinct finishes; polished brass, Venetian bronze, and Satin Nickel. I really like SmartCode because it gives Schlage Connected a run for its money. But it still has some work to do considering Schlage is a Grade 1 deadbolt. 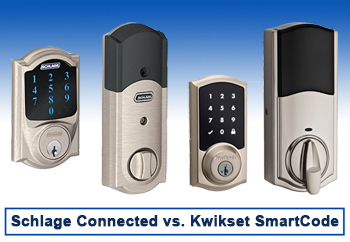 Kwikset SmartCode is an excellent choice for anyone looking for a Smart lock that can connect to any of the popular Smart Home hubs, whether, Wink, VeraLite, or SmartThings. Even though it is a Grade 2, the advanced Smart features guarantee 100% security against all cyber attacks that are taking a toll on a number of Smart Home devices. The Convert is an average but very interesting lock. It is an interior only Smart lock with up to a maximum of 25 eKeys. What’s good; Kevo App for Apple users and supports Android as well. The most interesting bit is the Amazon Key compatibility. In fact, this is what made me mention Convert in this review. Amazon key is a new delivery feature that allows Amazon to open your door when they are delivering your order when you’re not around. The debate on what’s the best between these two Smart locks can’t be approached from a general perspective. The most important feature when buying these locks is their compatibility and connectivity. This is what we will use as our foundation in the comparison review. I’ve started with these two because they have quite a lot in common. First, they all support Z-Wave protocol and thus can be used alongside Wink, Veralite, SmartThings among many other hubs. Personally, I have used Schlage Connected for over a year and it works seamlessly with my Wink 2 Hub except for some occasional bugs. They also have touchscreen displays and share several other features including 30 access keys, built-in alarm, Smartphone App remote operation, and so on. However, there are several major differences that you should note about them. First, Schlage comes with an ANSI/BHMA Grade 1 deadbolt that is the best in the industry while Kwikset comes with a Grade 2 lock. Another thing, while SmartCode only works with Z-Wave, Schlage is compatible with both ZigBee and Z-Wave protocols. As for SmartCode, the Touch-to-Open technology gives it better functionality compared to Schlage that lacks this cool feature. These two Smart locks have been built for Apple and are not compatible with Z-Wave, or ZigBee. They also share several other features including inbuilt alarms, touchscreens, 30 access keys, Alexa compatibility. However, besides design, there are a few key differences. First, which is obvious is the lock grade. Kwikset features a Grade 2 deadbolt while Schlage features a Grade 1 lock. On the other hand, Kevo has a readily available means of remote operations. However, with Sense, you will need a few more bucks to get the Wi-Fi Adapter for Smartphone pairing. This is a rather controversial topic that has never gone away and has now been dragged to Smart locks. From one perspective, this is a battle that is won on the Smart security frontier; it’s all about the Smart security features each lock offers. That said, Kwikset takes center stage courtesy of its more advanced Smart security features. Yes, they may have Grade 2 locks but when it comes to cybersecurity, it is a brand that is more alert. 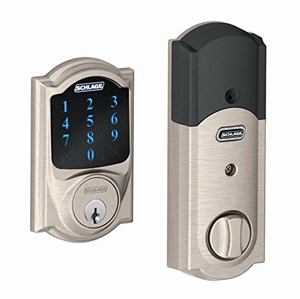 For example, while Schlage emphasizes on smudge free and fingerprint resistant finish, Kwikset has a patented Smart SecureScan feature that requires two-factor authentication which makes it hard for thieves to read your code from the smudges. On the other hand, while it may remain a matter of personal choice, I strongly believe in Schlage because of their reputation in building the most secure locks and deadbolts. I know of one that has actually survived a sledgehammer attack. I think this is unanimously agreed that Schalge is the best in security. This is evident from the fact that, while all the above Kwikset locks are Grade 2, Schalge Connected and Sense are Grade 1. From where I stand, I will go for Schlage anytime for this reason. Even though Kwikset has very beautiful designs and finishes, my number 1 priority is security! Getting a Smart lock is among the few interesting things you can try out this early in 2018. However, I know most of you have several worries regarding the security of their homes with these Smart locks that are prone to bugs and attacks. Yes, there has been a surge of attacks on home automation systems but still, the possibilities you get with one are irresistible. There has also been this issue of whether Alexa will open your door. Most owners at the time wouldn’t want to hear yes for an answer. But just to clear the air, Alexa will not open the door as of yet, But let’s see what 2018 has got in store for us! And now, folks, it’s time to wind up. What is your best Smart lock and why? Tell us in the comments section below! Philips Hue vs Lifx: An Unbiased Comparison 🏆 Deebot vs Roomba – What`s the Best Robot Vacuum Brand?